Executive Director Joan Frisz recently traveled to India. Following are her pictures and account of a visit to bell-making artisans in the state of Gujurat. In the western state of Gujurat, there are 6 villages in the Jhula region where they do ironwork and make bells out of tin and used oil drums. We visited the Zura (which means “blacksmith”) bell making community. The economy in the area is centered on cattle herding. Originally, the bells were made as cow bells and tuned to a specific tone for each shepherd to distinguish their herd. However, cows don’t roam as much as they did in the past, so the need for bells is not as high. Herders are still buying the best-quality bells. In this community, there were just 3 or 4 bell makers 60 years ago. However, the craft has expanded in the last 50 years. Now there are 50. There are approximately 160 bell makers in the 6 villages in the region. We met Ibrahim Iohar who has been making bells since 1974. His son, Saddam, works with his father and said that a lot of young people are beginning to take up the craft, as they want to carry on their fathers’ businesses. They are working on new products and sounds. One of the new products under consideration is the xylophone-like instrument (pictured). Put the cap and bell parts together. Finally, they are coated in limestone and copper/brass dust and covered with clay. This work is done primarily by the women in the community. Next, to the kiln. The charcoal is made from branches of the Babgol tree. The bell cooks for 15 minutes, reaching temperatures of 900° Celsius. One of the community development projects that Matr Boomie and their India Team (SETU) have worked on is improving the kilns in the area. There are 35 kilns in the region. Matr Boomie has sponsored 20 new kilns. These kilns can accommodate 8 bells at a time, rather than just 1, and so it has increased their efficiency. The remaining 15 kilns will be installed within the next year. 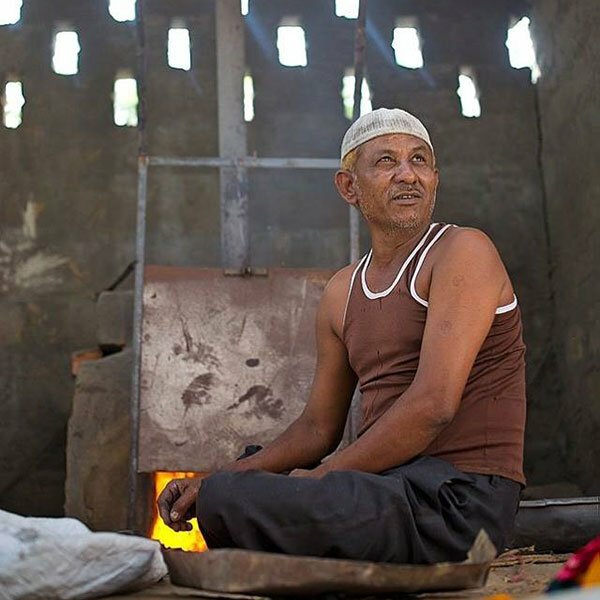 The improved kilns have doors, chimneys, and fire bricks, reducing the adverse health effects for the artisans. It is then taken out of the kiln to cool, the coating is chipped off, and we are left with the brass-colored bell that we know. Now it’s time to tune the bell. After the clapper is attached, the bell is pounded around the bottom to adjust the tone. This results in the “hem” seen on the bells. Each bell is hand-tuned.